A puzzling picture early in the new regime. A Baldwin is decorated for some reason at the head of a passenger train, but why do the tracks to the left appear to have a disused inner 75cm rail and clean bright outer rails? Many of the more influential local people had become rather disillusioned with the service provided by the FCCC. They saw the government's plans and the rumoured expropriation of the railway as altogether a good thing (1). Railwaymen on the other hand, whilst in favour of government ownership on political grounds, certainly did not see the conversion to 75cm gauge as a step forward. 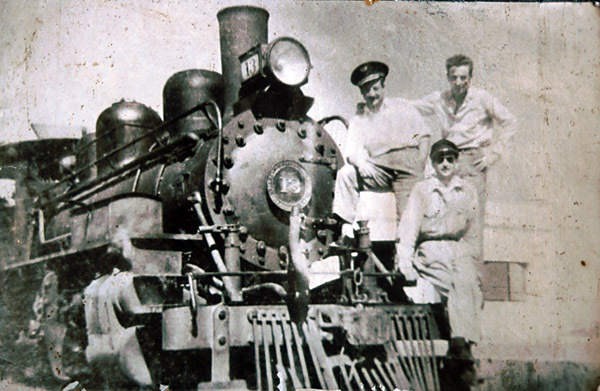 Edgar Calderón, later the last superintendent of the line, is on record as having had doubts about the speeds and load-carrying capacity of the narrower gauge (2). Q.E.D. - Trelew station. Date and circumstances unknown. The agricultural produce of the Chubut Valley was important to the railway. There was wool, and live sheep to be carried from the estancias, and a variety of fruit and vegetables grown on the irrigated parts of the valley floor. There were also sources of minerals to provide loads for the trains. Boca de la Zanja, Campamento Villegas and Las Chapas all had kaolin (china clay) pits alongside the railway. In the 1950s this was the most profitable traffic left to the railway. There were also limestone deposits near of Campamento Villegas. A 1957 report by the Puerto Madryn Traffic Superintendent also talks wistfully of further mineral deposits near Las Chapas, and hopes that they might be exploited to the benefit of the railway. The plans to extend towards the cordillera had looked forwards to trade between the coast and the cooler more fertile mountain valleys, but obviously that did not materialise. In the circumstances it is unlikely that the nationalised line satisfied the local populace any more than had the British owned railway. In 1934 there was a daily mixed train from Puerto Madryn to Trelew, that on Wednesdays carried on through to Alto de las Plumas. 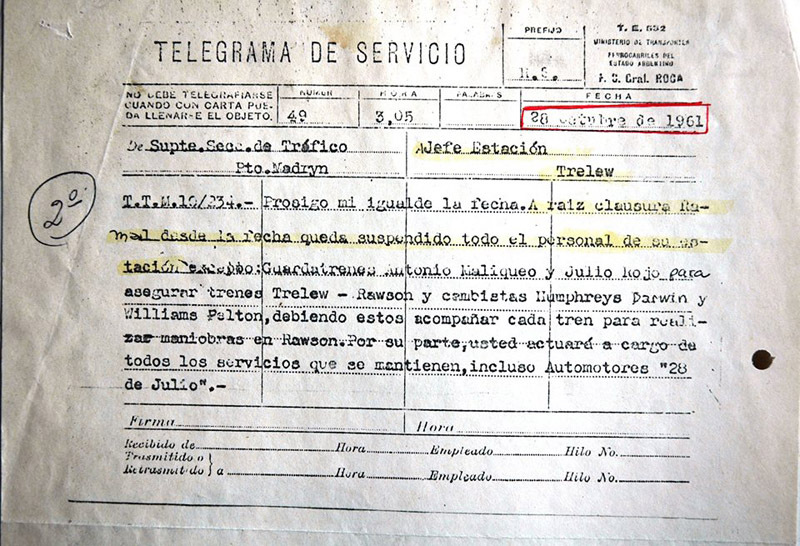 On the other six days a link was provided from Trelew as far as Dolavon, either by an evening mixed train or on Saturdays and Sundays by an evening coche motor. Trains stayed overnight at Alto de Las Plumas or Dolavon, returning the next morning. The Rawson branch, including the extension to the beach at Playa Unión, has a slightly better service, this being made up of ten 'mixtos' per week and an additional nine coche motores. This gave three trains a day most days. The timetable examined was current from 10 December 1934, covering the Christmas summer holiday and it may be that a winter service would have been somewhat sparser. This is available on an appendix page. By 1942 the mixed train from Pto. Madryn was down to three times a week, continuing to Alto de las Plumas on Wednesdays as before, though on the other two occasions the train went as far as Dolavon. 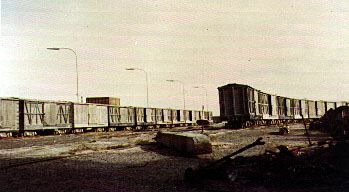 The morning link from Dolavon to Trelew and its evening return counterpart was provided five days a week by coche motor. The branch timetable tends to support the suggestion in the previous paragraph that a lesser timetable was run during the winter: the mixed train ran thrice-weekly, with coche motores adding an extra ten weekly journeys, thus giving roughly two trains each day on average. None of these ran beyond Rawson, confirming that the Playa Unión service was a seasonal one. The end of the war seems to have seen a slightly build up of traffic, as the mixed trains from Puerto Madryn are back up to five times a week, of which one as usual went right through to Alto de las Plumas and two other continued as far as Dolavon. The evening/morning service from Trelew to Dolavon ran daily at this point, but always as a mixto. The Rawson branch was also busier, with two mixed trains a day, and four coche motores in addition mostly running only on working days. By the mid 1950s one would have expected road transport competition to have been building up substantially. Certainly there is one weekly 'mixto' from Trelew to Alto de las Plumas as before, and the usual morning/evening train from Dolavon and return also continues to run every day except Sundays. However, there is no sign of any trains at all between Trelew and Pto. Madryn. This is public passenger timetable, so the implication is that any such trains were by then freight only. On the Rawson branch there seem to have been two or three coche motores each day, each continuing to Playa Unión this being the summer season. Though from a late date in the history of the railway the 1960 working timetable rules give some insight into the detailed working of the railway. Trains bound for Puerto Madryn from Trelew would sometimes have a banking engine attached at the rear for the first 7 or 13km depending on the load. This would uncouple without notice, presumably by the fireman releasing the front coupling from the running board. 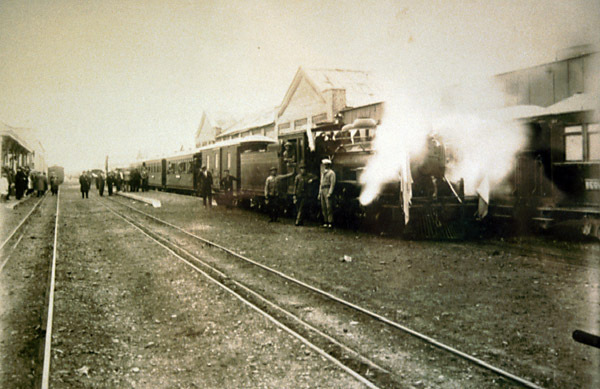 Whilst passenger trains ran only as far as Rawson on the branch during winter, in the summer months they were extended to Playa Unión. The weekend trains often loaded to 23 coaches. 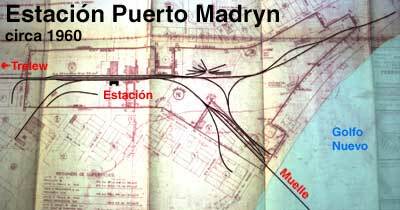 Whilst track layouts at Rawson and Dolavon have been shown on the extensions page, here is the final layout for Puerto Madryn. That for Trelew is so large that it has been placed on a separate appendix page. Click here to see it. The Puerto Madryn layout shows a number of loops at the station and the largest number of sidings on the approach to the muelle as one might expect. The loco depot has a turntable but there is also a triangle. There are several private sidings. It seems that points/switches were normally set such that a runaway approaching from the south would be diverted safely rather than colliding with other stock or over-running onto the muelle. 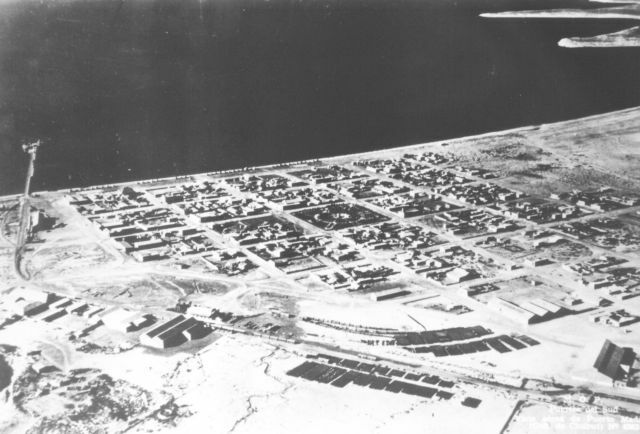 There exists an aerial view from the 1940s (available on the web) which looks down from the low hill at top right of the plan above, showing the small size of Puerto Madryn in those days. It shows clearly the curve towards the sea and also the other curve towards the warehouses. The station building at the beginning of the curve towards the sea can be seen but the large warehouses opposite its front no longer exist and have been replaced by the modern bus station. After the nationalization of all foreign-owned railways by President Juan Perón in 1948, the F. C. E. lines in Patagonia were combined to form the Ferrocarril Nacional Patagónico with effect from 1st January 1949. This probably made little difference other than to introduce a new livery. A first class carriage of the 1922 batch was lying at Rio Gallegos in the 1970s still carrying a brown livery with the word 'Patagónico' below the roofline and '1a' at each end of the bodysides. There were still signs of optimism despite the growing competition from road transport. A 1955 report from the 'Patagónico' management to the commissioner for Chubut Province is attached (together with an English translation). This talks of station rebuilds, proposed new diesel-electric locomotives, negotiations for new railcars, and the transfer of surplus 75cm. gauge stock from the 'Ministerio de Obras Publicas' in Comodoro Rivadavia. It also mentions the hopes for a broad gauge line from Puerto Madryn north to Sierra Grande and eventually to join the General Roca line at San Antonio (Oeste). More realistically it refers to the rural bus/ coach services (Automotora Pullman)which the railway was promoting as feeder services. Baldwin no. 13, in the 1940s or '50s judging by the clothes of the crew. However, traffic seems to have declined rapidly in the late1950s owing to road competition. The only bright spot was that a new 10km. branch had been opened in 1945 at Las Chapas to serve the Florentino Ameghino Dam construction site. About 1,500 tons of cement a month came up from Comodoro Rivadavia by sea and train. There were also two temporary stations to serve the two construction workers' camps. The dam work kept the line open until 1958 when the work ended. The line was then completely closed from 1960. A report from 1961 analysing the financial prospects if the line was to be reopened, can be viewed in Spanish and in English. The terms of this telegram are a little strange as all services are supposed to have ended the year before. The implication is that there was a service being maintained between Trelew and Rawson. While no mention is made of engine crew, this is not surprising as they would not be under the stationmaster's control. As shunting is having to be done at Rawson, it would suggest that steam trains were being used rather than a coche motor which might not need to be turned. Of passing interest interest are the two names of probably British origin. The difficulties of working an isolated railway line which runs only to the coast and not to the major cities, are covered elsewhere in this site. However, even at the end the railway was still employing about 300 people. Suggestions were made for reducing this to 200, but I suspect that Argentinian politics would not have allowed the staffing levels to be reduced to 'sensible' levels. For a railway operating the number of trains that this one was doing, a sensible number of employees might have been 30 or so! Would this have made sufficient difference to costs to allow the railway to remain open? A more recent parallel is with the Esquel line. This too employed about 300 staff. The FFCC Argentinos ducked the question of sacking many of them by off-loading the whole line onto the provincial governments. The railway closed, presumably making all 300 redundant, and the Chubut part was then re-opened and has a current staff of, I believe, twenty-one. The track and equipment remained intact and in 1964 it was proposed to reopen the railway. 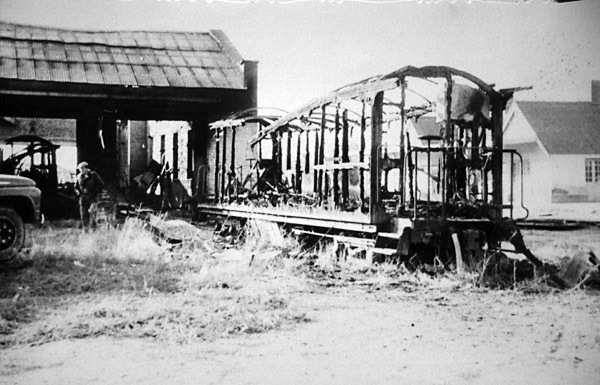 This was vigorously opposed by the local bus companies, but the proposal was only finally killed by a mysterious fire which swept through Trelew carriage shed one night destroying fifteen carriages. 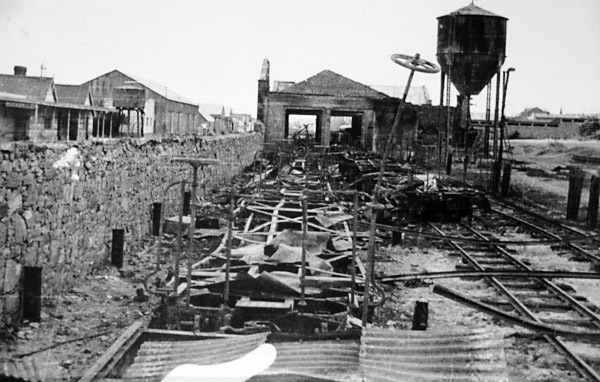 A view looking west through the carriage shed shortly after the fire in 1964. The station building is on the far left. The track was lifted between 1969 and 1974, with the section in Gaiman tunnel being the last to go. Marcelo Arcas visited Trelew during the 1960s and has displayed a selection of his photos from that period on the web at <http://www.rumboalsud.com.ar/k-trelew.htm>. My visit in 1975 showed much goods stock still lying at Puerto Madryn, whilst one Henschel 2-8-2, two Henschel 0-6-0Ts and one crane tank lay derelict. Some wagons were still in use on the pier. The goods shed was also still in use. 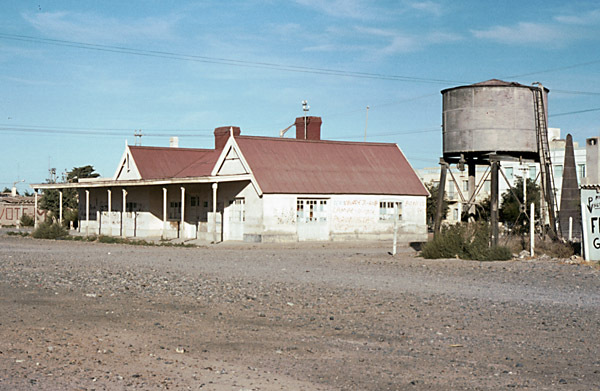 At Trelew the goods shed was used for wool storage, whilst the goods offices had become a bus station. 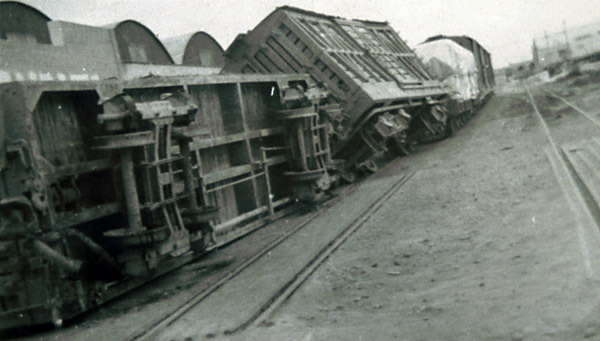 There were also a broken weighbridge and the hulks of four Baldwins lying in the shell of the old loco shed. 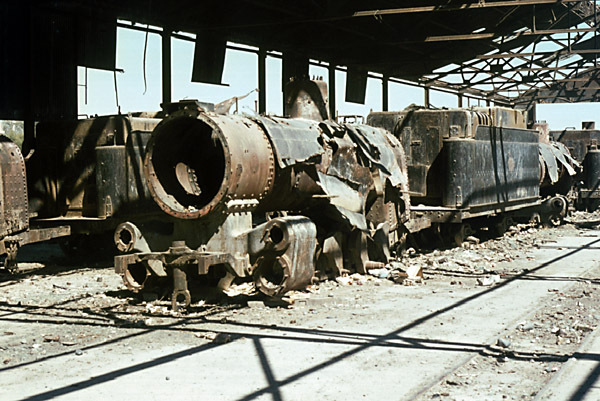 These engines look to have been stripped professionally, perhaps for the parts to be re-used at El Maiten. Vandals or stealers of non-ferrous fittings would hardly have gone so far as to lift the frames and take some of the wheelsets! 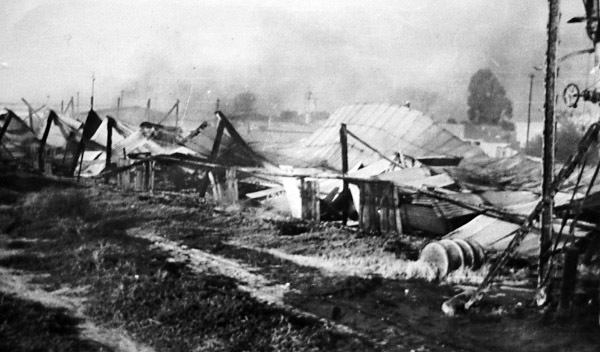 There is a page in chapter four devoted to the surviving parts of the FC Central del Chubut. Relics of the 75cm gauge period are covered there. 1 Article in El Pueblo. 2nd December 1921. 2In Los Ferroviarios que perdiamos el Tren. V. Accorinti et al. 3 Found in archive of Museo Nacional Ferroviario Raul Scalabrini Ortiz, Buenos Aires.